Egyptian Chronicles: Saudi Arabia’s NEOM and Egypt’s territories : We need to ask !! Last week, Saudi Arabia’s crown prince “and de facto king” Mohamed Bin Salman aka MBS declared that the Saudi government was going to build a huge futuristic megacity at the North West part of the kingdom. The name of $500 billion cities is NEOM which means “Neo” or New in Latin and “M” stands for “Madina” aka City. The big city which is bigger than Lebanon, Qatar, and Bahrain combined is going to have its own laws under Saudi sovereignty. Located on the Red Sea, NEOM will include Jordan and Egypt’s territories too !! Yes, you read it right it will include both Jordanian and Egyptian territories and that’s was the first time we hear about in Egypt. I do not know about Jordan. Here is the quote from the official statement released by the Saudi government about NEOM. NEOM’s land mass will extend across the Egyptian and Jordanian borders, rendering NEOM the first private zone to span three countries. I think citizens in both countries owe their government an explanation. Needless to say, there is a complete silence radio from the Egyptian regime’s side. The Saudis are the ones who revealed more details. NEOM will also include Egypt’s Tiran and Sanafir islands as well parts of North Sinai. You read it right, Tiran and Sanafir which the current Egyptian administration gave it to Saudi Arabia despite the court orders saga has not finished yet. Needless to say, the Saudi officials forgot to tell the Saudi people how they are supposed to get Israel's approval for any plans in the two islands as they are part of Camp David treaty aka Zone "C". Considering what is happening between Saudi officials and Israeli officials behind closed doors, I believe that they got their approval. The Saudis are saying that the King Salman bridge between Egypt and Saudi Arabia linking Asia and Africa is part of that huge futuristic mega city. The site will also become the main entrance to the King Salman Bridge, linking Asia and Africa, which will add to the zone’s economic significance. I thought that Sinai Peninsula has been playing that role already !! Anyhow that ugly bridge will affect the marine life negatively is back despite architects say that it will be hard to construct such bridge there. In an interview with Bloomberg, MBS said that alcohol would not be allowed in that new city and that if any tourist wanted to drink any alcoholic beverage then he should go to Egypt or Jordan !! This quote tells you a lot about Egypt’s true position in the Arab world now. MBS revealed that the Egyptian territories in the project were located at the Egyptian-Saudi Free zone area according to an agreement signed by Sisi and his father King Salman in his infamous 2016 visit which ended with giving up Tiran and Sanafir. I have not heard any request from any MP to the government explain what the hell is going on. 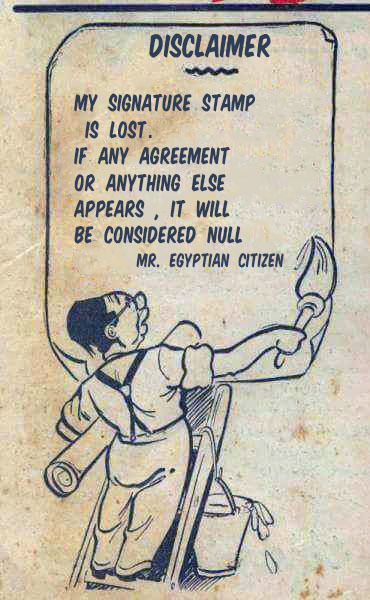 I have not seen Egyptian TV hosts raising questions about that new city and our involvement in it as they should be. Now, I wonder which part of North Sinai is involved in that Mega-city, is Rafah or Al-Arish or is it Taba !? Till when will we get the news from abroad? We need to ask questions for real. Next January, the Supreme Constitutional is supposed to say its final word about the demarcation deal. I was supposed to publish that disclaimer months earlier when the Egyptian House of Representatives passed the Egyptian-Saudi demarcation deal and how the Egyptian President ratified it in June. In August, the ratification and all the details of the demarcation deal including PM Sharif Ismail’s official correspondences with his Israeli counterpart about the demarcation deal were published in the State's official gazette. I could not because the Windows OS had its own drama. It is never too late to post that disclaimer. I keep this disclaimer on my blog till the return of Tiran and Sanafir to Egypt. I believe as Egyptians we should speak about those two islands all the time till their return to Egypt. From five days ago, a Sharkia criminal court sentenced 23-years old Andrew Salib from Leftist Bread and Liberty Party 5 years in jail based on charges from the current Counterterrorism law. Salib was among the members of the leftist unofficial part that were arrested earlier this year during a crackdown on the activists opposing the Tiran and Sanafir agreement. He was accused by the State security prosecution of “spreading lies online about the State”. This is a first-degree court verdict that can be appealed. If Salib loses the appeal then he will be the first Christian ever to be prosecuted by the Counterterrorism law. It is worth to mention that this incident shows how this law will be used in matters not related to terrorism as you see !!! Back to Saudi Arabia, I am seriously worried for the future of Saudi people and the kingdom for real now more than anything. Tiran and Sanafir constitute very valuable real estate. Why were the Egyptian authorities so keen to give them away? Who benefited? What did Egypt get in return? The Wikipedia entry on the history of Tiran does not make this clear. This is an Arab afair. Isnt it better to start thinking in more collborative terms instead of confrontational terms? Egypt will do nothing with those tiny islands, Saudi government has great vision for them and the money to do it, why not collaborate? Collaboration and theft are two different things. There is nothing in the Saudi plan for the islands that requires that their ownership be transferred from a poor country to a rich one. If the deal truly will benefit the whole region, let MBS build it without taking ownership. If he won't build it without taking ownership, he doesn't believe the whole region will benefit, and he will be revealed to be a liar. MBS is a fat, pompous tick, swollen with oil. He believes the Egyptians are hicks, yokels, and an easy touch. This is a terrible deal for rank-and-file Egyptians. If it goes forward, watch the Egyptian elites for sudden conspicuous wealth.